California sea lions are known for their intelligence, playfulness, and noisy barking. Their color ranges from chocolate brown in males to a lighter, golden brown in females. Males reach 850 pounds (390 kg) and seven feet (2.1 m) in length. Females grow to 220 pounds (110 kg) and up to six feet (1.8 m) in length. They have a "dog-like" face, and at around five years of age, males develop a bony bump on top of their skull called a sagittal crest. The top of a male's head often gets lighter in color with age. These members of the otariid or walking seal family have external ear flaps and large flippers that they use to "walk" on land. The trained "seals" in zoos and aquariums are usually California sea lions. California sea lions are found from Vancouver Island, British Columbia to the southern tip of Baja California in Mexico. They breed mainly on offshore islands, ranging from southern California's Channel Islands south to Mexico, although a few pups have been born on Año Nuevo and the Farallon Islands in central California. There is a distinct population of California sea lions at the Galapagos Islands. A third population in the Sea of Japan became extinct, probably during World War II. Most pups are born in June or July and weigh 13 to 20 pounds (6 to 9 kg). They nurse for at least five to six months and sometimes over a year. Mothers recognize pups on crowded rookeries through smell and vocalizations. Pups also learn to recognize the smell and vocalizations of their mothers. Breeding takes place a few weeks after birth. Males patrol territories and bark almost continuously during the breeding season. California sea lions are very social animals, and groups often rest closely packed together at favored haul-out sites on land or float together on the ocean's surface in "rafts." They are sometimes seen "porpoising," or jumping out of the water, presumably to speed up their swimming. Sea lions have also been seen "surfing" breaking waves. California sea lions are opportunistic eaters, feeding on squid, octopus, herring, rockfish, mackerel, and small sharks. In turn, sea lions are preyed upon by Orcas (killer whales) and great white sharks. Their population is growing steadily, and California sea lions can be seen in many coastal spots such as the Monterey Coast Guard jetty and PIER 39 in San Francisco. The current population is approximately 238,000. California sea lions are our most common patients at The Marine Mammal Center. In 2009, we admitted over 1700 animals. Nearly 1400 of these were California sea lions. The most common reasons California sea lions are rescued include: malnutrition, domoic acid toxicosis, leptospirosis, cancer, pneumonia, entanglement in debris or fishing gear, gunshots, and other wounds. In 2009, many of the sea lions that stranded were malnourished yearlings. Animals can become severely underweight from maternal separation, disease, lack of food sources, effects of El Niño and other environmental factors. In 1998, the Center diagnosed the first case of domoic acid toxicosis in marine mammals; a condition caused by harmful algal blooms which causes the animals to have seizures. Although the Center has conducted extensive studies to better understand this disease, hundreds of sea lions are affected annually. Shop our online gift store and help The Marine Mammal Center care for our sea lion patients! This Barking Sea Lion Plush Toy lets out a joyful bark with every squeeze! A perfect gift for ages 3 and up. 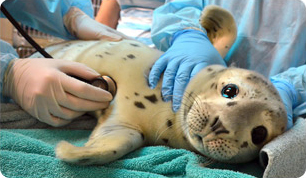 You can help our patients by Adopting Chippy, a wayward sea lion that was rescued far inland. Put on these Sea Lion Slippers and take a walk with a couple of soft sea lions. Sized to fit kids up to 4 years old.